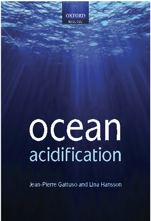 Further to the blog post below, readers of the EPOCA blog can now pre-order the book “Ocean Acidification”, to be published by Oxford University Press in September, with a 20% discount. If you would like to make use of this offer, go to the web page for either the hardback or the paperback of the book (whichever is preferred), add the book to the shopping basket and apply the promotional code webgatt11 on the left hand side of the screen. The ocean helps moderate climate change thanks to its considerable capacity to store CO2, through the combined actions of ocean physics, chemistry, and biology. This storage capacity limits the amount of human-released CO2 remaining in the atmosphere. As CO2 reacts with seawater, it generates dramatic changes in carbonate chemistry, including decreases in pH and carbonate ions and an increase in bicarbonate ions. The consequences of this overall process, known as “ocean acidification”, are raising concerns for the biological, ecological, and biogeochemical health of the world’s oceans, as well as for the potential societal implications. This research level text is the first to synthesize the very latest understanding of the consequences of ocean acidification, with the intention of informing both future research agendas and marine management policy. 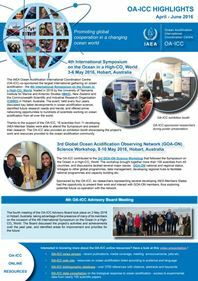 A prestigious list of authors has been assembled, among them the coordinators of major national and international projects on ocean acidification. Readership: Suitable for graduate level students as well as professional researchers in oceanography and marine biology. It will also be of relevance and use to a more general audience of marine scientists and managers interested in the effects and potential impacts of ocean acidification. Oxford University Press, 8 April 2011. Web site.